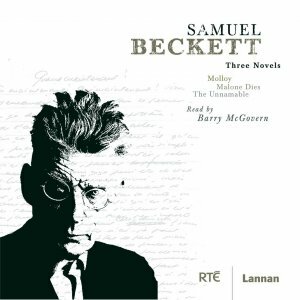 Three Novels is a recording on 18 CDs of the Irish Nobel Laureate’s famous trilogy of novels, Molloy, Malone Dies and The Unnamable. Featuring the voice of the well-known Irish actor Barry McGovern, the CD box set offers nearly 20 hours of Beckett’s greatest prose works along with a 58 page booklet on the writer’s life and work by Beckett scholar Gerry Dukes. The booklet is illustrated with images of Beckett taken by leading photographers, including John Minihan, Lutfi Özkök and Roger Pic.